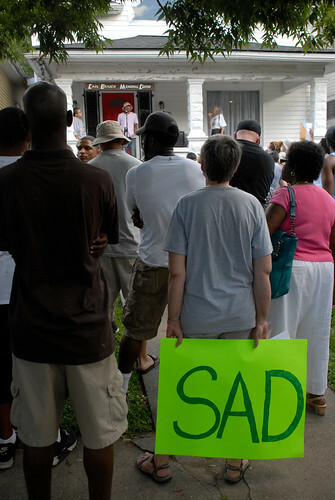 I have been sitting on a blog post about the Trayvon Martin verdict since Sunday. Then I decided that I wouldn't write anything, because many people are saying many things, much better than I can. For example, this blog post. It is perfect. Read it. But, as Prout so eloquently says, "Silence kills people. Ideas kill people." So. Here I am. I went to a rally on Sunday, because updating a Facebook status or tweeting felt insufficient. There, a teenage boy told those gathered, "I don't know if it makes me more sad or mad, to people, I just don't matter." That is the message this verdict sends. A man can kill a child (and yes, at 17, you are still a child. You may be legal for some things at 18, but think about exactly how mature you were at 18) and go home. I have work to do. On myself. On my own reactions. I can be better. And happily, there are ways to get involved in Louisville. 1. Anti-Racist Actions for Trayvon Martin (Louisville) - this is currently the Facebook event that was Sunday's rally, and is being updated with more events. There be trolls there. 2. Louisville SURJ (Showing Up for Racial Justice) - "Louisville SURJ is a local effort to organize white people for racial justice." That would be me. 3. Louisville Celebrates 'Collective Liberation' - on July 28th, from 3-5 p.m., this event celebrates what would have been Anne Braden's 89th birthday and the release of "Toward Collective Liberation: Anti-racist organizing, Feminist Praxis, and Movement Building," by Chris Crass. The book includes a chapter by Louisville's Carla Wallace (who founded #2, and co-founded Louisville's Fairness Campaign). There will be cake and punch, and surely some interesting conversation. If you know of other, similar, local groups or events, please leave it in the comments.